Trains have so much more to offer the traveller than simply getting from A to B; great train journeys are adventures in themselves, always generating good memories and can be a vacation in itself. As for flying, that’s invariably best forgotten, my only memorable flight is years ago being bumped up to business class on a 14-hour flight home from Tokyo. The best of the rest are just a fog of mindless tedium and the worst are horrors buried too deep in my subconscious to mention. As for boats and cruises my abiding memory is watching lunch being chucked over the side and wishing I was dead. Trains are no longer the preserve of those who can’t afford to fly or the train spotter obsessed with locomotive engine numbers. 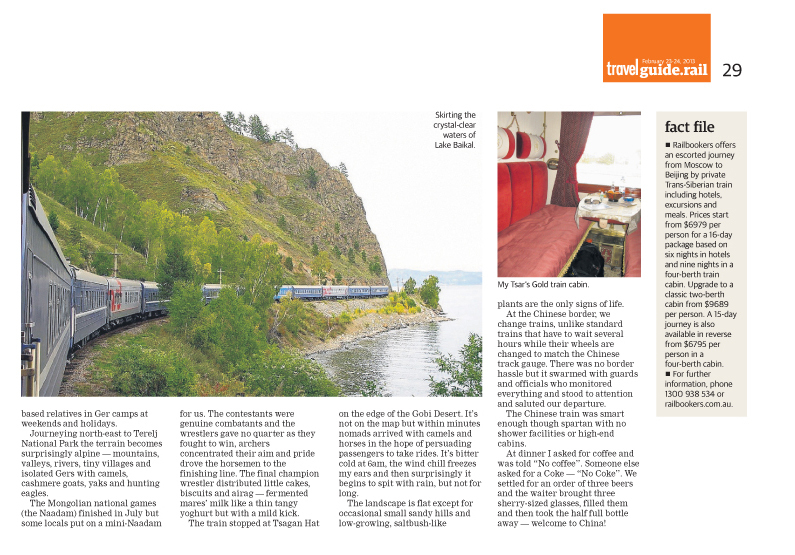 Rail travel has been rediscovered by the modern eco-friendly traveller who wants some adventure but without too much hassle or discomfort. 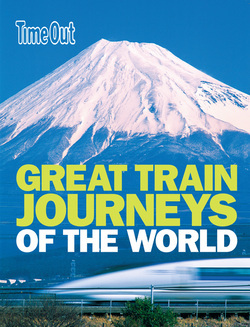 Great Train Journeys of the World is a great armchair read, a fascinating collection of 40 great railway journeys from around the world. It’s not the usual coffee table picture book (although it does include some great photography) nor is it a disguised sales brochure; its essence are descriptions of exotic journeys, insider tips and practical details by a host of travel writers who have been there and done it. 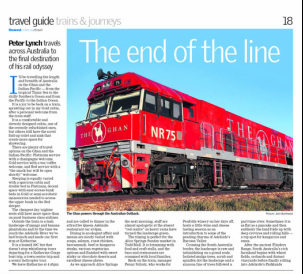 My small contribution to the book was the fabulous Indian-Pacific route from Sydney to Perth. Rail travel does not have the monotonous uniformity of air travel nor are you anonymously processed like a piece of cargo, to be strapped into a seat until you can be off-loaded. 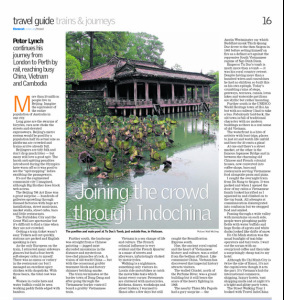 Maybe you think that because trains are stuck on tracks the scope for exploration is limited but the array of rail travel possibilities is huge, you could travel - fast or slow, active or lazy, five star or two star, luxury dining or BYO, meet locals or travel with people from home. If its slow and historic that appeals then the North Yorkshire Moors Railway would be hard to beat. 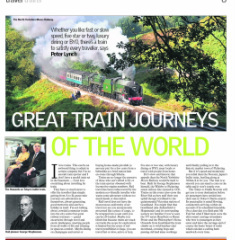 Built by George Stephenson himself the Whitby to Pickering steam railway line, opened in 1836. Trains on this route criss-cross the River Esk as they puff their way uphill though woodland to the quintessential Victorian station of Goathland. You might find that Goathland (aka Aidensfield or Hogsmeade) and its surrounding scenery are familiar if you’ve seen the TV series Heartbeat or Harry Potter and the Philosopher’s Stone. Onwards from Goathland the train climbs onto wild heather clad moorland, crossing bogs and passing old lead mine workings until finally pulling in to the historic market town of Pickering. 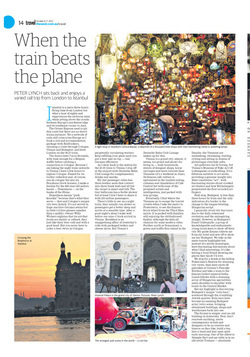 Istanbul is a mere three hours flying time from London; but what a host of sights and experiences the airborne miss whilst jetting above the clouds between Europe’s northwest edge and its southeast corner with Asia. The Orient Express used to ply this route but there are no direct trains anymore. Yet a network of rails still criss-cross Europe so I booked a rail and accommodation package with Railbookers, choosing a route through Cologne, Vienna, Budapest and left London on the 8.27 train. Two hours later, I’m in Brussels with time enough for a Belgian waffle before catching a connection to Cologne. Because I was taking the night train onwards to Vienna I had a few hours to explore Cologne. 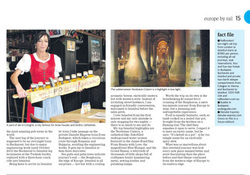 Famed for its gothic cathedral and of course Eau de Cologne but also its famous Brauhaus’ (brew houses). 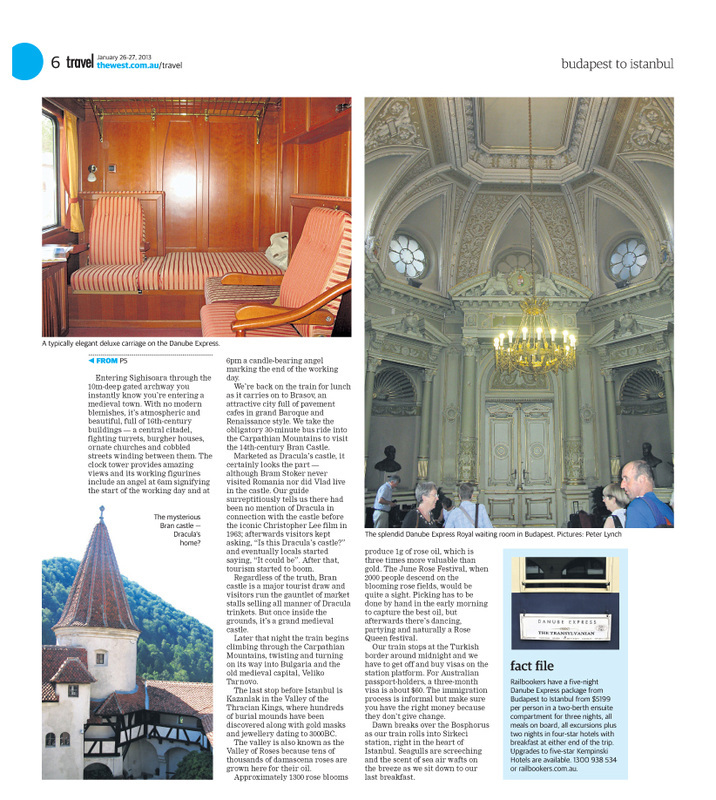 I made a beeline for the 800-year-old sailors haunt – Haxenhaus – on the banks of the Rhine. Haxenhaus means ‘Pork Knuckle’ because that’s what they serve, that and Cologne’s unique city beer called kolsch. It’s not served in huge 1 litre German steins but in little 0.2 litre glasses (smaller than a middy). Owner Willy Wichert explained its not that locals are dainty or refined, they just like their beer cold and with a good head. But you never have to order a beer twice in Cologne; perpetually circulating waiters keep refilling your glass until you put a beer mat on top – real German efficiency! As I swayed back to the station for the 20.05 train to Vienna I stopped off at the airport style Deutsche Bahn Club lounge for complementary drinks and snacks. My 3m² passenger cabin had three leather seats that converted into three bunk beds and all but the carpet was smart and tidy. The tiny bathroom had a feeble shower but at least I didn’t have to share it with 250 airline passengers. There’s little to see on a night train, they usually run slower so passengers get a better sleep and arrive at a sensible time. After a good nights sleep I woke well before our 09.00 arrival in Vienna. Breakfast was an unappetising affair of yesterday’s rolls with packaged turkey and cheese slices but Vienna’s Deutsche Bahn Club Lounge made up for this. Vienna is a grand city; almost it seemed, too grand and showy for living in - wide boulevards, streets of designer shops, horse carriages and more tourists than Viennese (weekend in June). Its famous café culture is epitomised in the vaulted ceiling, columns and chandeliers of Café Central but with none of the promised artists and intelligentsia, just packed with tour groups. Eventually I found where the Viennese go to escape the tourist crowds when I took the metro to Praterstern, to see the famous Ferris wheel from the Third Man movie. It was packed with families still enjoying the old-fashioned fun fair although the kids all clamoured for some modern rides. Further north at Donauinsel, a green and traffic free island in the Danube, the Viennese were sunbathing, swimming, boating, cycling and sitting in dozens of picturesque riverside cafes. A mere ninety minutes from London and I’m amongst the green hills surrounding Coruna in Galicia – northwest Spain. The green hills of Spain – home of the spaghetti western and hundreds of square miles of blistering dry olive groves - surely that can’t be right? This is the Costa Verde and its like no where else in Spain. The region is separated from the rest of the Iberian Peninsula by the wild and rugged Cantabrian Mountains - a haven of protected areas and national parks - home to bears, wolves, wild boar and adventurous hikers. The rain in Spain … doesn’t actually … stay mainly in the plain – a song obviously written by someone who’s never been there. The rain actually falls mainly on the mountains, which is why the green northern coast is so lush with forests, fields of wheat, maize and potatoes. 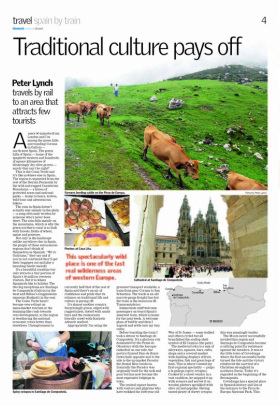 Not only is the landscape unlike anywhere else in Spain, the people of these autonomous regions don’t think of themselves as Spanish – ‘we’re Galician’s’ they say and if you’re not convinced they’ll get their bagpipes out and play a haunting Gaelic melody. Its a beautiful coastline but only attracts a tiny portion of Spain’s thirty million overseas visitors but its where Spaniard’s like to holiday. The two big tourist exceptions are Santiago de Compostela (Galicia) in the west & Bilbao’s Guggenheim museum (Euskadi) in the east. The Costa Verde has been more astute than the rest of Spain and hasn’t become over reliant on mass-market tourism or the lemming like rush towards over development, so the region is weathering the national economic crisis better than elsewhere. Unemployment is currently half that of the rest of Spain and there’s an air of confidence & pride that their reliance on traditional Spanish life & culture is paying off. It was a very practical journey which anybody could do, I spent three months on the rails because I did not want to rush my way through countries I had never been to before. If you did want to rush, it could probably be done in three weeks - but what would be the point of that? I had no problems or hassle on any part of the journey although I did make it as easy as possible for myself. I bought all my visas before leaving home - Russia, Mongolia, China, Vietnam, Cambodia, Thailand and an Australian e-visa. I know its possible to buy IndoChina visas at the border but not when you cross into Vietnam at two in the morning and it also saves having to identify and fend off rip-off border visa touts - I breezed through all border controls in a matter of minutes. 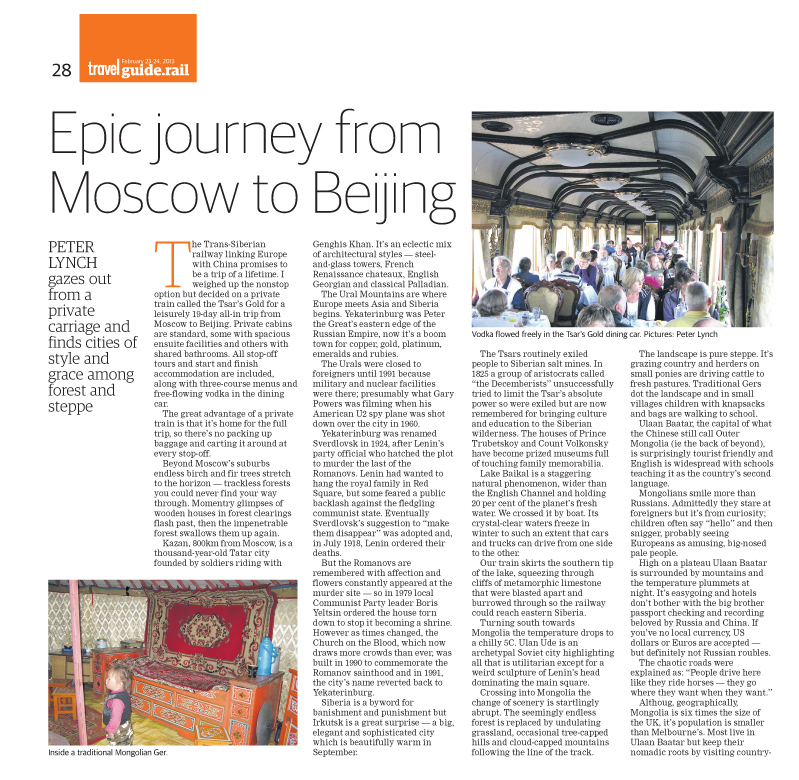 Another part of the planning that simplified the journey was pre-booking many of the rail tickets and stopover accommodation with Railbookers in London who organised all the tickets and accommodation through from London to Beijing. Although they have many packaged rail/accommodation trips they can also organise almost any bespoke route and mine was a real one-off. While flying I'm invariably craning my neck from the window and straining to catch a glimpse of those exotic sounding lands so tantalisingly out of sight. On this trip to Australia I'm seeing it all by simply glancing out of the train window and getting off whenever the fancy takes me. Its not a backpacking trip, it'll be as comfortable as I can make it. 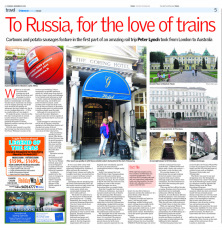 I started at the 5 star Goring hotel in central London, which for more than a century has been a grand jumping-off point for Orient Express travellers setting off across Europe for Asia. My wife also wanted to see why The Goring was the hotel of choice for Prince William's in-laws at the recent royal wedding. It has a stunningly up-market ambience that is a world away from typical 5 star luxury hotels; managing to be friendly & informal yet at the same time rather regal and distinguished - quite a unique feat. Next morning, rail tickets and hotel vouchers in hand, I said goodbye and caught my first train from St Pancras station to Brussels, a much underrated city that most travellers simply pass through. Although its mainly renown for its beer and chocolate, Belgium's capital is also the cartoon capital of Europe and boasts three cartoon art schools. St Petersburg and Moscow have always been rival cities; St Petersburg was the aristocratic capital until 1918, when it was deemed too elitist and Moscow became the new communist capital. Peter the Great founded St Petersburg on a swamp in 1703, intending it to rival the grandest cities of Europe, which it does. Its often called the Venice of the north because of its multitude of canals, 300 bridges, linking 42 islands - but only if you can image Venice full of cars. I took the four hour Eurostar class high-speed 'Sapsan' train from St Petersburg to Moscow arriving at Leningradski station. An excellent three course lunch was served and all passenger announcements were repeated in English, including an offer to order a taxi to be waiting for you on arrival - how cool is that? Apart from being a vast metropolis Moscow was far more disorientating than St Petersburg because all latinised signage has been removed and everything is in cyrillic. Fortunately a friendly Russian on the train bought me a metro ticket and helped me through the subway system to my destination. Over 20 million people live in Beijing – imagine - the entire population of Australia coming to live in Perth! Long gone are the swarms of bicycles, cars now choke the streets and elevated expressways. Beijing’s metro system is excellent - for a population half its size and platforms are crowded and trains arrive already full. Beijinger's are tidy folk and don't drop much litter, but many still love a good spit. The harsh anti-spitting penalties introduced during the Olympics have worn off so it was good to see the ‘spit-mopping’ ladies swabbing the passageways. It’s not the regimented communist city I imagined although ‘big brother’ does block web access. The Beijing 798 Art Zone was a great surprise - hundreds of galleries sprawling through disused factories with huge art installations, street musicians, market stalls, street cafes, bars and little restaurants. The Forbidden City and the Great Wall were spectacular but its best to avoid the crowds at weekends. Getting a train ticket wasn’t easy, tickets sell out quickly, stations are packed and English speaking is rare. 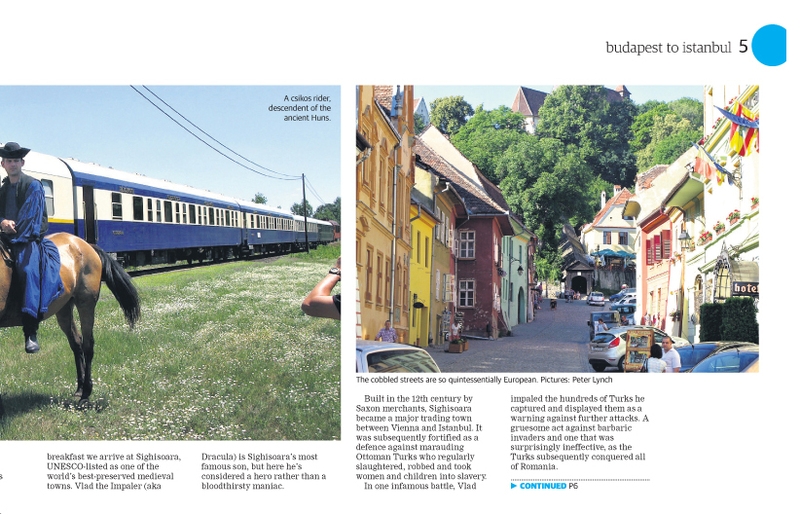 As the only European on the train I attracted many sideways glances but had a four-berth soft sleeper cabin to myself. There was no menu or cutlery in the restaurant car but I managed an excellent spicy chicken with chopsticks and with three beers it cost $6. Passengers gathered in the private lounge at Hualampong station. Even the gleamed gold lettering on the train’s green and cream livery was outshone by the ever-smiling carriage stewards who quickly settled passengers into their cabins that would be home for the next three days. 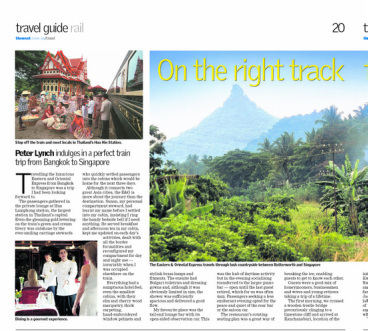 Although it connects two great Asia cities the Eastern & Oriental Express is more about the journey than the destination. Sunan, my personal compartment steward had learnt my name before I settled into my cabin and he's more butler than train official, insisting I ring the handy bedside bell if I need anything. Sunan served breakfast and afternoon tea in my cabin, kept me updated on each day’s activities, dealt with all the border formalities and reconfigured my compartment for day and night use - invariably when I was occupied elsewhere on the train. Everything had a sumptuous hotel feel, even the smallest cabins, with their elm and cherry wood marquetry, thick carpeting, hand embroidered window pelmets and stylish brass lamps and fitments. The en-suite had Bulgari toiletries and dressing gowns, obviously limited in size but the shower was sufficiently spacious and delivered a good shower. Darwin is a long way from everywhere else in Australia and it seems that city planners never really expected the Ghan to get that far north, because they forgot to leave space for a station. Fortunately a complimentary bus picks up passengers from hotels and transferred them to the station - 20km from the city centre. This is the last leg of my global rail trip where I’ll be travelling the length and breadth of Australia – from the tropical Timor Sea to the chilly Southern Ocean and from the Pacific to the Indian Ocean. It was a joy to be back on a train again after a cramped flight from Singapore that dumped me in Darwin at an uncivilised 4.20am. But all that was quickly forgotten as I sprawled out in my Gold cabin and got a personal welcome from the train staff. It’s a comfortable and cleverly designed cabin, one of the recently refurbished ones but others still had the novel fold up toilet and sink that creates more space for showering. .... As we approach Alice Springs the next morning staff were almost apologetic at the absent ‘red centre’ as heavy rains had turned the landscape green. I’ve wanted to go to Switzerland for years. Even though it’s only a tiny country squashed and pushed up thousands of feet above sea level between France, Germany and Italy it has absorbed culture from all three of its neighbours as well as developing a uniqueness all of its own. Switzerland is not all bankers, fondue and après-ski – it’s a country that the rich and famous still flock to and it has the most gloriously accessible mountain-scape in the world. Realising that I needed to up my style level for chic Switzerland I began my journey at the Renaissance hotel, which used to be the main entrance to London’s fantastical Victorian gothic St Pancras station. I ate dinner in the cavernous ‘booking office’ and my bedroom overlooked Eurostar trains quietly waiting for early morning departures. After a leisurely breakfast I stepped out of the hotel directly into the station and began my trip at Europe’s longest champagne bar – right next to the trains. After a quick dart under the channel to Paris, a smart TGV to Basel and a Swiss train south, where snow and mountains increased with every mile, we arrived at Interlaken. Our evening meal was at the authentic Swiss ‘Laterne restaurant’ where I discovered why my fondue always flops. It needs to be made with Emmental and Gruyere cheese, a good splash of white wine and a shot of kirsch – fabulous. 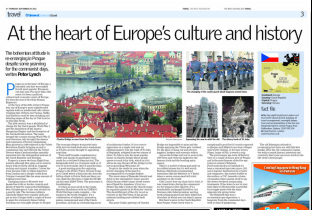 Prague is in the heart of Europe, it’s a beautiful city and in 2010 was ranked fourth most popular European city. For the over a thousand years its been a political, cultural and economic centre of Europe. It’s been the seat of two Holy Roman Emperors although personally I like the sound of Mad Rudolf II, emperor of Bohemia. How come our leaders don’t have useful descriptive titles like this nowadays? At the turn of the twentieth century Prague was one of Europe’s most sophisticated capitals with an intellectual café culture rivalling that of Paris and Vienna. Kafka and Einstein could be seen drinking and debating issues of the day at Café Louvre on Narodni trida. The twentieth century was a whirlwind of change for the Czech people. World War I saw the dissolution of the Austro-Hungarian Empire and the formation of the Czechoslovak nation. The Nazis ravaged the country during World War II and liberation only brought the misery and repression of communism. High-speed trains are all the rage at the moment. The Chinese are planning a direct route into Europe and Deutsche Bahn (German railways) have just completed tests for a 200mph (320kph) service between London and Cologne (4 hrs), Frankfurt (5 hrs) and Amsterdam (4 hrs). I can’t wait. Maybe travellers able to pay extortionate first class airfares might disagree but I’ve never experienced a moments joy whilst flying and the flight is only a fraction of the total journey time. Recent research has calculated that 80% of the average European short-haul journey is spent on the ground hassling to, from and inside the airport. Venice is my favourite city; I haven’t been back for three years and am getting withdrawal symptoms. My last two attempts to fly there have been thwarted by volcanoes and strikes. Determined to get there this time I bought rail tickets from London to Venice. As a seasoned traveller I’m familiar with European national rail networks so with a smattering of language and detailed study of each systems idiosyncrasies it’s not too difficult. 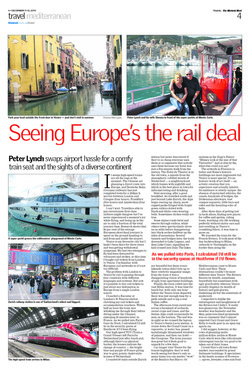 The problem with London to Venice by rail is passing through four countries with different languages and different systems, which turns a minor effort into a significant one. But now its possible to buy all your rail tickets from a single London source (www.railbookers.com) to just about any destination in Europe (and elsewhere) – offsetting the big bugbear of language and timetabling hassles. 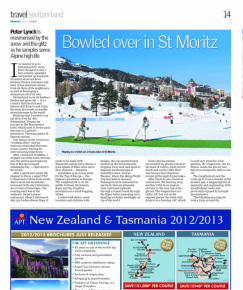 Britain is so full of fascinating heritage opportunities that it is difficult to chose what to do on a short visit. The easiest option is to leave it to a tour operator to make the choices and organise everything for you. The downside of this is getting herded around, jostled in big queues and, as one Eagle reader recently told me, sometimes getting unsuitable accommodation in out-of the- way places. But this is Britain, most of us speak English, it’s easy to get around and there are some great trips that package tours miss. If you have limited time, a good idea is to combine heritage excursions: i.e. 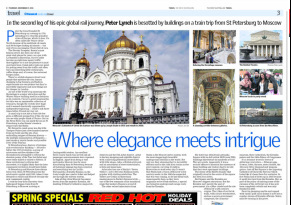 a steam train journey and a city visit. Steam Dreams run a wide range of steam train journeys from London to major tourist locations in southern England. 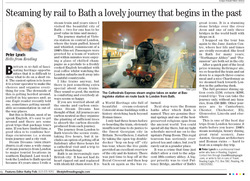 Last week I took the London to Bath special because it’s years since I rode a steam train and years since I visited the beautiful city of Bath - two for one has to be good value in time and money. The journey started at Victoria station in central London, where the train puffed, hissed and whistled, reminiscent of a 1940’s film set. Passengers were greeted by a team of waiters and within minutes were enjoying a glass of chilled champagne as a prelude to a freshly cooked English breakfast with real coffee whilst watching the London suburbs melt away into beautiful countryside. The Baltic Sea to the Swiss border: Lubeck-Munster-Heidelberg-Freiburg-Augsburg by train. The German rail network Dautsche Bahn is superb, it can take you to almost anywhere in the country. I decided to take a nationwide rail trip from the Baltic north coast to the southern Swiss border, stopping only at small historic towns (see www.historicgermany.com) to find out more. Lubeck is a UNESCO World Heritage Site of alleyways, cobbled streets, step-gabled roofs and Gothic architecture. Its most famous icon is the 1478 Holstentor, bulwark and gateway into the city and featured for years on the old 50 Mark note. Founded as a Baltic seaport in 1143 Lubeck grew to become the third largest city of the Holy Roman Empire or the First Reich - the central European power created by Charlemagne in 800 AD and ended by Napoleon 1806. Next stop Munster, which was heavily bombed in WWII, apparently in retaliation for the destruction of Coventry cathedral. It has been beautifully restored and dubbed ‘cycle city’ with twice as many cycles as people (everyone has a posh Sunday bike), multi-storey cycle parks, cycle wash facilities and 4,500km of dedicated track, including a city cycle ring road. My next stop was home to Heidelberg man (Homo erectus cira 600,000 BC) at one time Europe oldest known inhabitant. Today the spectacular partially ruined castle at Heidelberg is its crowning glory. This eclectic mix of Gothic fortress, High Renaissance architecture and Baroque palace towers over the Neckar River and the red roofed city below. Further southwest is Freiburg, which claims to have Germanys best weather. This attractive town of burger houses, squares, street mosaics and towering 13th century cathedral is less than an hours drive from France or Switzerland. It has a unique system of fast flowing streams (Bachle) criss-crossing the city ranging in size from 6 to 20 inches. Fortunately I didn’t stumble in any as tradition says you will stay and marry a Freiburger. They were the town’s original water supply for firefighting and livestock and a 20ft granddaddy canal powered mill, bathhouses and a tannery. My final historic German city was Augsburg in Bavaria, which was founded by the Roman Emperor Augustus in 15AD. Its one of Germanys most historic cities. Messerschmitt’s were built here and Rudolf Diesel invented his engine but it was Mozart’s house that I wanted to visit. This superb little museum is a life story in manuscript, pictures, music and memorabilia. Young Wolfgang spent his formative years here although the six-year-old musical genius wrote his first piano sonatas in Salzburg.